to bring our whole crew and check out their new location in Gastonia, North Carolina! much there was to do and filmed all the fun to share with you guys. It’s exciting to have a new location for family entertainment in the area! 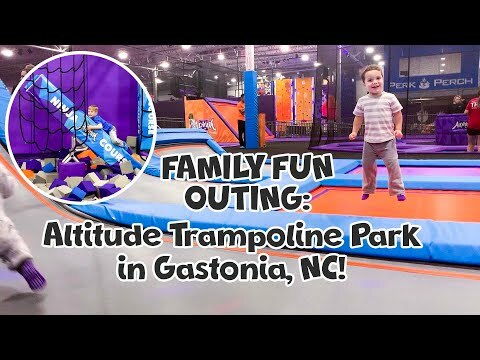 FAMILY FUN – Altitude Trampoline Park in Gastonia! and a whole huge space for parties, she started asking if she could have her birthday there this summer! 2 hour jump time, access to the entire park, food and drinks, party set up and clean up! Love that because it means the parents can have more FUN at the party and be with their people. and Hunter, well, he just loved the wide open space and was zooming all over! Over 20,000 square feet of indoor trampolines and other fun! If you are in or near Gastonia, North Carolina you need to plan your own visit!! I promise you’ll have a blast. You should go with kids…or as a date night! Thanks again to Altitude Trampoline Park for inviting our family out for such a fun night. ps. Bedtime was. BREEZE that night! Yay for tired happy kiddos. TRY IT!